Can run CMI from hard drive (play without the cd`s) and can automatically copy the required files to the hard drive. Can enable CMI’s debug mode. See the readme for more information on this. Works on both 32 bit and 64 bit versions of Windows and has been tested on XP, Vista and Windows 7. Windows 98, ME and 2000 are not officially supported but should work correctly. Loads one of 6 random images as the main launcher image – for added eye candy. This tool is still subject to the quirks and limitations of trying to run this old game on new versions of windows. As such there may well be bugs and problems when the game is run. 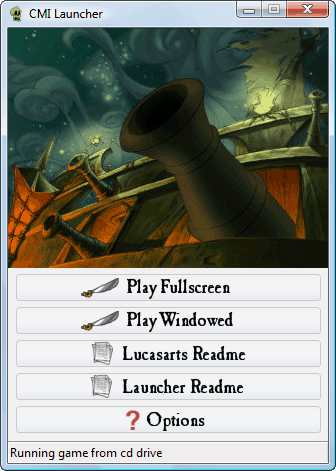 While these bugs can be worked around, I strongly recommend you try and run the game through ScummVM instead.